There’s not a single downside to gratitude — except that it’s easy to ignore. When put into practice, gratitude creates a virtuous circle. It fosters contentment, joy, respect, and connection to our world and the people in it. You might say it’s a recipe for happiness. Gratitude makes us feel good inside. And when we share it, other people feel good inside. And you know what happens then: The feel-good-insiders send their goodwill to more people, who in turn start feeling good inside. Good feelings boomerang everywhere. Now if that sounds too absurdly optimistic, consider this: Free-flowing gratitude can help you get unstuck. “Feeling good lubricates mental efficiency, making people better at understanding information and using decision rules in complex judgments,” writes psychologist Daniel Goleman in his book Primal Leadership. Translation: It makes you smarter. The rub is, we can’t just hit-and-run with gratitude — you know, give a little to get a little. Any feel-good spike we may achieve will quickly erode. 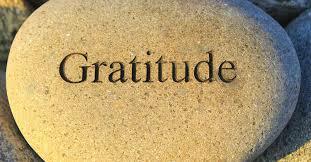 But if we consider and express gratitude regularly, then we can maintain our good feelings. It’s a matter of creating the habit. Try this: Whatever your get-things-done method is, fold in a “what are you grateful for?” reminder. Then come up with ways to act on your gratitude. Here are 40 to get you started. 1. For a job well done, be the one who publicly gives credit to all the contributors. 2. Make a list of things you take for granted, like running water and supermarkets, and then imagine your life without them. 3. Find out what someone’s favorite hot beverage is and buy one for him — and let him know why. 5. Say something kind to the coworker who gets on your nerves. 6. Show handmade appreciation for long-term friendships: a custom playlist, homemade cookies, personalized T shirt, framed photo of you together. 7. When someone gossips, pay a compliment to the person under scrutiny. 8. Buy a membership to a museum you wouldn’t want to live without. 9. Let someone cut in the grocery or coffee line if they seem like they really need it. 10. Care for the outside space you spend time in (hiking, picnicking, lying on the beach) by leaving it better than you found it. 11. Tell someone she looks nice today. 12. Mail a handwritten letter to someone who’s made your life better in some way, big or small. 13. Show patience with a person who is having a bad day. 14. Create a holiday and name it after the person who means the world to you. 15. Put a nice note attached to your tip in the coffee shop tip jar. 16. Leave a sweet Post-it note on the bathroom mirror for a special someone to find. 17. Donate what you can — time, money, or goods — to causes that you believe make the world better. Some to consider: Goodwill. Your local food bank. National Military Family Association. World Wildlife Fund. The Children’s Aid Society. Books for Africa. Project C.U.R.E. Habitat for Humanity. Environmental Defense Fund. You can find many more at charitynavigator.org. 19. Listen without distraction to a friend who needs listening to. 20. Send your pal a funny card or ecard. 22. Give holiday tips to the people who regularly provide services to you. Emily Post offers her guidelines here. 23. Participate in websites that are dedicated to gratitude, such as We Love Gratitude. 24. When you someone offers you a compliment, say how much you appreciate it instead of deflecting it. 25. Invite a neighbor over for a meal or a glass of wine. 26. Reach out to someone just because. Not because it’s a special occasion, or you need something, or you’re organizing plans — but just to check in and say hi. 27. Leave a personal voicemail instead of texting. There’s a powerful intimacy about the human voice. 28. When offering criticism, preface your comments with something positive about that person or his or her work. 29. Publicly compliment a friend on Facebook, Twitter, at a party. 30. Tell your folks how lucky you are to be their kid. 31. Keep a birthday calendar so you can wish people well at least once a year. 32. Energy is infectious! Be enthusiastic about plans, projects, and events. 34. Offer to babysit or dog walk for a friend who seems stressed out. 35. Reach out to important people in your life when something big happens. It’s always nice to be among the first to know. 36. Pick up the bar tab for a friend who is going through financial difficulties. 37. Think of a favor someone once did for you and try to pay it forward (offered a networking opportunity that helped you get a job; assisted with a move; coached you through a difficult break up). 38. Write a note to someone’s manager to report great service. 39. Wear, use, or otherwise acknowledge a gift in the presence of the gift-giver. 40. If there’s a blog or a website you love, send an email to the authors to say how much it means in your life.